Every wedding detail is important, but finding a wedding photographer takes time and care, as the choice you make will matter for years to come! Finding your venue is always the first stop you should make on the road to planning your perfect wedding. Once you’ve booked the venue, you’ve got a date, a place, an open bar, and delicious food for your guests. Following that decision, it’s nice to enjoy some down time before jumping into the nitty gritty details. However, when looking at next steps, it’s important to prioritize by taking into account the availability of different types of vendors. For instance, florists can do more than one event per day, so you might worry less about that than a photographer, who is just one person, and therefore cannot double book. Selecting a wedding photographer is one of the most important decisions you’ll make. While you should absolutely live in the moments as they happen and truly enjoy your wedding, when it’s all said and done, you’ll be looking at your photos for a lifetime. For that reason, you should be a bit more judicious about your photographer selection. The great news, though, is that there are so many options available, no matter what style or budget you’re looking for. You might find yourself drawn to a more traditional photographer, whose strength lies in capturing group portraits and posed moments. On the other hand, you might be more interested in a photojournalist who focuses much more on capturing an accurate portrayal of how your day unfolds. Maybe you like vintage-style photographers or someone who will notice and capture all of the tiny details you’ve planned, or maybe you want someone well-rounded who can do any and all of these things. Regardless of the style you’re most in favor of, a good wedding photographer should have a lot of experience and understand the need for capturing a little bit of everything. You might not care to have shots of every single table at your wedding, but it might be nice to have the keepsake of a family portrait. A good place to begin your research is with your venue’s preferred vendor list. Whether they recommend these partners formally or not, venues always have photographers that they know and are comfortable with. Here at Brooklyn Winery, for instance, we recommend several photographers, all of whom are comfortable working in the space, are extremely professional, and offer a wide variety of pricing options. The bottom line with wedding photographer pricing is that it’s all contingent upon the elements you want to include. Do you really need an engagement shoot? A lot of couples like to use those shots for stationery, while it’s pretty unimportant to others. Do you need a second shooter? This will heavily depend on guest count, so we recommend that you heed your photographer’s advice. How many albums do you need? How many hours of coverage are necessary? Expanding upon and cutting down on these options have a huge effect on the budget, and most photographers will provide both recommended packages and additional à la carte options. 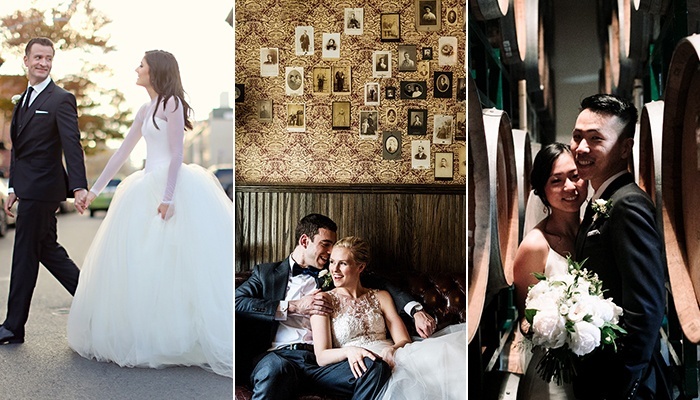 At the lowest end, you should expect to pay $3,500 for a good quality wedding photographer. A good estimate to work with if you plan to include a second shooter, coverage of at least the full event, and an album, is somewhere between $5,000 and $7,000. Don’t be surprised, however, if you see proposals up to $10,000. Don’t panic! It’s like we said—no matter what, there are always options. Photographers with similar styles can be found at almost every budget level. Just make sure you take the time to meet with them and look at a large selection of their work. Photographers’ blogs are a great place to see the greatest variety, as opposed to solely considering the sample albums they might show you. You should also make sure to ask about seasonal pricing. As with all types of vendors, wedding photographers have off-seasons, so a package in February may be priced quite differently than the same option in September. You’re armed and ready to go, but the final, and perhaps most important piece of advice—make sure you like your wedding photographer. They’re going to spend a lot of time around you on your big day!